After his controversial Helsinki summit, President Trump was panned by Democrats and Republicans alike for seeming to side with Russia over American intelligence agencies. In Virginia’s 7th Congressional District, some constituents wondered why their congressman, Rep. Dave Brat, didn’t add his voice to the mix. An anonymous artist created a cartoon picturing Brat as the eponymous character hiding in the pages of a “Where’s Waldo” book. Others, like Adam Short, went the route of direct action. 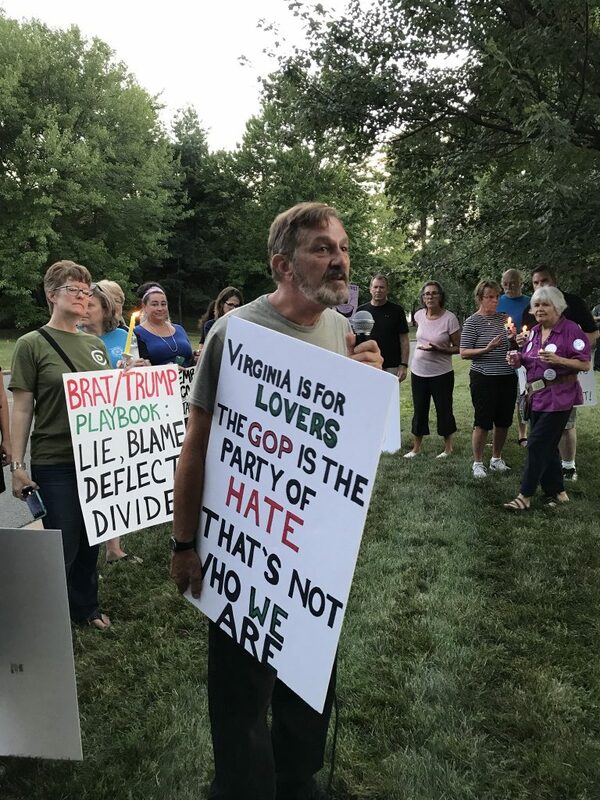 Short, who returned to his native Virginia after a few years living in Washington, D.C., hosted “a vigil for Dave Brat’s conscience,” a protest in collaboration with the progressive policy group MoveOn and area Democrats, last Wednesday. “Someone needs to step in and stop what’s, essentially, a takeover by the US government of the Russian mob. I know that sounds like hyperbole, but it looks pretty straightforward,” Short said, discussing his motivation. I just want to hear him say that he’s not working with Russian trolls to subvert democracy. 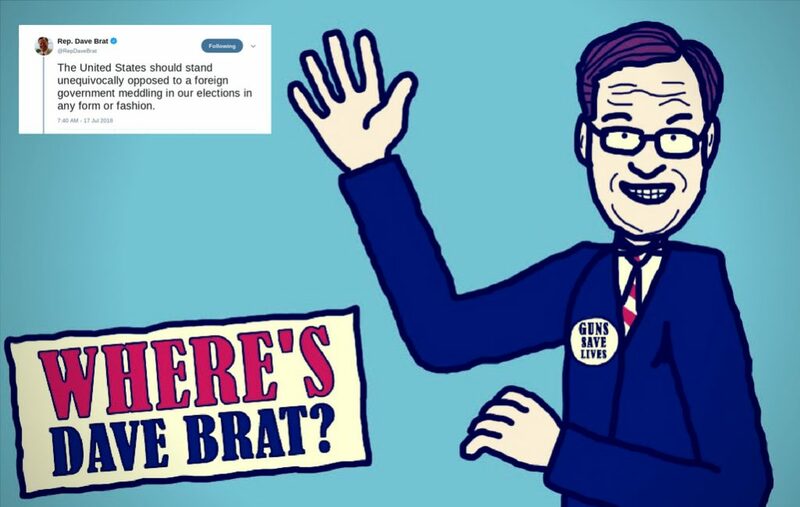 While Brat did issue a tweet stating that the “United States should stand unequivocally opposed to a foreign government meddling in our elections,” he immediately followed it up with further tweets redirecting the issue to President Obama’s time in office. His office did not return emails asking for comment. Some 100 people joined Short for the protest, held at 8 p.m. on a Wednesday night. 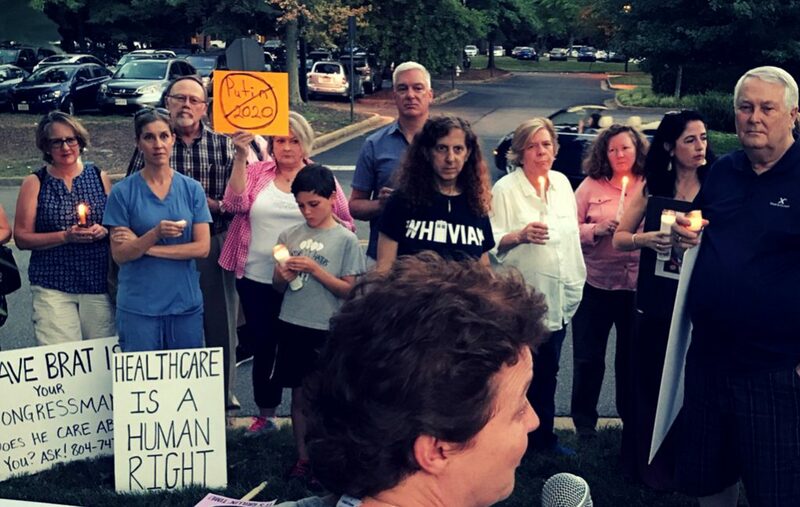 Among them were Melissa Thomas McKenney, who organizes with other local progressives as part of the group Together We Will Henrico. McKenney helped plan the event, and is a stalwart supporter of Abigail Spanberger, Brat’s Democratic challenger. 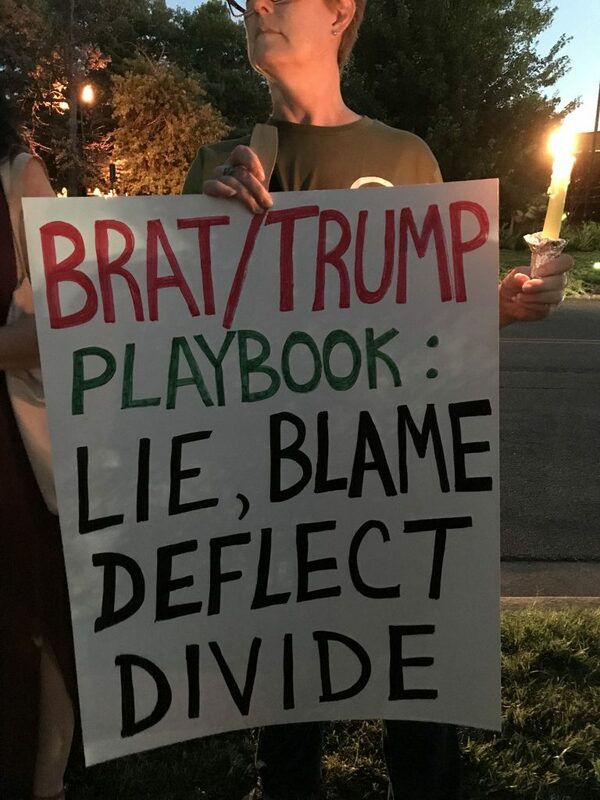 McKenney joined the effort for two reasons: a feeling that Brat isn’t available to constituents, and concerns over Brat’s statements on Russian interference. In light of mainstream Republicans, like Rep. Will Hurd, a congressman from Texas and former CIA operative who wrote a letter to the New York Times alleging that Trump is being manipulated by the KGB, she questioned Brat’s reticence on the Helsinki summit. For McKenney, that “somebody” is Spanberger, the former CIA operative and Democratic candidate for the 7th District congressional race. Short agrees with her that Spanberger would be a better representative, but he’s worried that voting isn’t enough. Constituents who feel neglected by Brat will have another chance to reach their representative. Together We Will Henrico plans to protest at his Glen Allen campaign office on Fri., July 27. For once, organizers told me, they won’t be wondering “Where’s Brat?” They know exactly where he plans to be; inside the office, celebrating his birthday.